1897.69.8A Front of the plate showing the Prince Regent and Maria Anne Fitzherbert. Accession Book Entry - 1897. July 3. BATEMAN:- Plate with repres. of dandy horse 5/-. The plate itself is quite crudely made, and would probably have been a fairing or cheap piece of crockery. Around the rim of the plate are yellow and red flowers with green leaves. In the centre is an image of a man and woman on a machine, described in the museum records as a 'dandy-horse'. The man is operating the machine and the woman, who is riding side-saddle, is holding an umbrella. The plate has a maximum diameter of 174 mm (just under 7 inches). On the front of the plate, beneath the image, is a caption, 'A visit from Richmond to Carlton House'. This is Richmond in southwest London and Carlton House in Pall Mall in central London. On the reverse is the museum label and the remains of another label, which may be the dealer's. Bateman (from whom the plate was bought) appears to have been J. Bateman, a dealer based in Gloucester Green, central Oxford. Nothing more is known of him, he does not appear in the 1901 census. Five shillings in 1897 is worth £19.50 in 2006 (using the retail price index, calculation performed using the Measuring Wealth website). According to the label found on the object the item was purchased in Moreton-in-the-Marsh, Oxfordshire (which is incorrect as Moreton-in-marsh is in Gloucestershire, close to the Oxfordshire border). The image on the plate refers to George Augustus Frederick of Hanover, (1762-1830), known as the Prince Regent and later George IV, whose residence was Carlton House until 1820 when he ascended the throne (see George IV at Wikipedia for more information about him). He is the best known resident in the house and the timescale fits (dandy horses were popular just before 1820 when he was Prince Regent and still resident in Carlton House). The Prince Regent was probably the ultimate dandy of the time. Carlton House was an opulent residence, which could be called a palace when the Price Regent was living there so lavish was its decoration. The house was demolished in 1825 and replaced by Carlton House Terrace. The proceeds of this were used to fund building Buckingham Palace which George IV rebuilt once he had ascended the throne. The reference to Richmond refers to Maria Anne Fitzherbert (1756-1837). She was married to the future George IV in 1785 (her third marriage), but this marriage was considered invalid under the Royal Marriages Act of 1772 because it had not been approved by George III, his father. In any case, it would not have been possible to marry as she was a Roman Catholic. The relationship lasted until 1811. Sweet lass of Richmond Hill"
The plate is therefore a light-hearted political commentary about the scandal of their marriage and on-going relationship. The dandy horse may have been specifically chosen, not only to link George IV and Maria Fitzherbert on the same machine, but also because its name was synonymous with the high living of the early nineteenth century, which the Prince Regent epitomised. 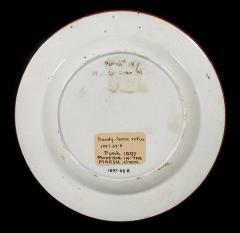 The relatively crude workmanship of the plate shows how news of their relationship had percolated through society. Such satirical and political themes were often used in such ware as were items commemorating special events, picturesque views, and portraits of celebrities. Plates, cups and saucers were all decorated in this manner. Not a great deal is known about the maker of the plate. There is no maker's mark on the reverse as there would have been for one of the noted bone china or porcelain makers of the early nineteenth century (of which there were many). The site showed a photograph of this object, its rim decoration was different, and it is more finely made, but the image was identical of a man on a dandy horse with a woman sitting side-saddle carrying an umbrella behind him. According to the Dandy Horse entry at Wikipedia the dandy-horse was invented by Baron Karl von Drais in Mannheim, Germany, and patented in January 1818. He was the chief forester for the Grand Duke of Baden, and used the machine for travelling through the land which he supervised. His name for it was Laufmaschine ('running machine'). For a machine with a very short popular life, it has very many names. 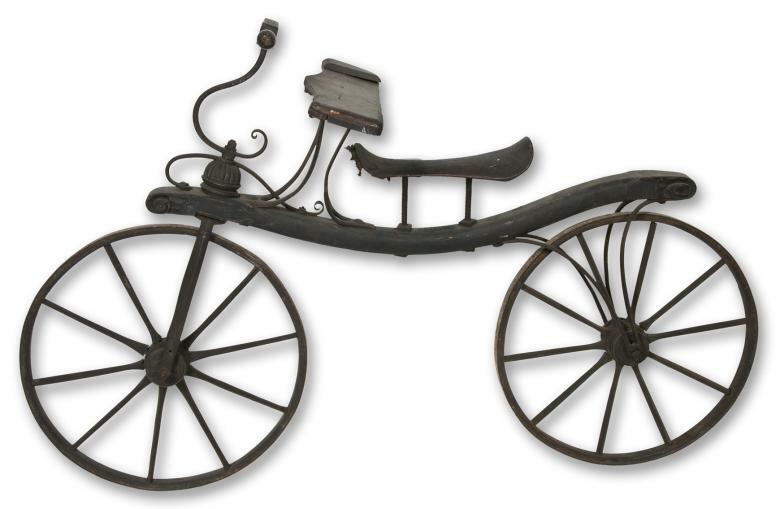 It was known as dandy-horse, velocipede, hobby-horse, swiftwalker, pedestrian curricle, celerifere and draisine or draisienne. According to the Glasgow Story website, it was called dandy-horse because 'few people other than young dandies were willing to ride them (or could afford the high price of purchasing one'. It was a two-wheeled vehicle, with both the wheels in a line, which was propelled by the rider pushing along the ground with their feet as when they were running or walking. The rider could pivot the front wheel and handlebar to allow the horse to be steered. There was no suspension or pneumatic tyres so the horse must have been very uncomfortable to ride. There were several manufacturers in France and England including Denis Johnson of London, a coachmaker. He even designed a woman's drop frame model. According to the Smithsonian Institution, riding academies were established to teach the finer techniques of balance etc. Buster Keaton rode a dandy-horse in Our Hospitality. The film crew were unable to find an actual horse so they built one to match existing drawings and prints. After the film was shown in 1923, the Smithsonian Institution asked Keaton to donate the dandy-horse to its collections, which had no authentic examples. You can see this at the National Museum of American History's Hobby Horse object . In the same collections there can be seen an early example of the original hobby horse from the Smithsonian collections which was donated in 1964 and thought to have been made in France. The strange thing about the dandy-horse depicted on our plate and other examples is that the our horse is being used to carry a second person as well as the rider. All other images of a dandy-horse that the author has seen during this research have been used by a single rider only. Why did the Museum collect the plate? The Museum owns very little English china from the nineteenth century. It does not appear to have collected the artefact for its intrinsic value, it was a rather crudely worked plate in common use when it was produced. It was thus also not been collected because it is a good example of its type or a rarity. The Pitt Rivers Museum above all else is known for one thing, for its typological displays; that is, its weapons are displayed together, as are musical instruments, all food-related items etc. This has been so since the founding collection was transferred in 1884, and follows the way that that collection was displayed by its donor in Bethnal Green Museum prior to 1884. The plate was purchased to order for the display about transport. This is not because the museum could not afford or obtain a copy of the actual dandy horse, there is one in the collection as we know. However the museum is very small, and display space is very constrained, the decision must have been taken show only transport models. The plate is, therefore, the equivalent of an illustration or photograph that a modern curator might use for the same purpose. 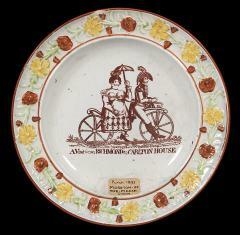 The plate shows a form of transport that has evolved since the plate was produced into the modern bicycle. Evolution was a key concept in the mind of Pitt Rivers who gave the founding collection. He believed it was possible to identify the various stages of the evolution of a form and his displays at Bethnal Green Museum were arranged to show this evolution 'from the simple to the complex, and from the homogeneous to the heterogeneous'. [Lane Fox, 1877: xi] Different examples were sought of each level of evolution for particular artefacts. In the same case with the plate are other examples, presumed to show different levels of evolution like the model of a sledge from Montreal in Canada [1924.6.21] or an articulated lorry made from oil cans from Zimbabwe [1993.45.1]. The cycle is designed to show a more complex form of technology, and also one presumably familiar to the museum audience. The iconography on the plate is being used for comparison purposes with other models and examples of transport technology. I believe that many of the English items were obtained at least partly for this purpose, to provide a familiar contrast to more exotic examples. Thus the plate fulfills two functions, it illustrates compactly a form of transport which is itself too large for the available display area; it also shows in its iconography one form of transport for comparison purposes. As an artefact in itself, until recently it was not of interest to the museum. Lane Fox, A.H. 1877. 'Catalogue of the Anthropological Collection Lent by Colonel Lane Fox for exhibition ... Parts I and II' London: Her Majesty's Stationery Office.